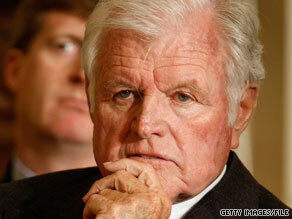 Massachusetts Sen. Ted Kennedy, known as the "Lion of the Senate," died Tuesday at 77. (CNN) -- Massachusetts Sen. Edward Kennedy, the patriarch of the first family of Democratic politics, died late Tuesday at his home in Hyannis Port, Massachusetts. He was 77. President Obama will deliver a eulogy at Kennedy's funeral on Saturday. He was "not only one of the greatest senators of our time, but one of the most accomplished Americans ever to serve our democracy," Obama said, speaking to reporters during his vacation in Martha's Vineyard, Massachusetts. "His extraordinary life on this earth has come to an end. The extraordinary good that he did lives on. For his family, he was a guardian. For America, he was the defender of a dream." Obama said that Americans knew Kennedy's death was coming for some time, but have been "awaiting it with no small amount of dread." Choking back tears, Vice President Joe Biden said his family was "truly distressed" by Kennedy's death. "He was probably best known for the ability to work with Republicans," said Adam Clymer, Kennedy's biographer. "The Republican Party raised hundreds of millions of dollars with direct appeal to protect the country from Ted Kennedy, but there was never a piece of legislation that he ever got passed without a major Republican ally." Under a 2004 Massachusetts law, a special election must be held 145 to 160 days after a Senate seat becomes vacant. The winner of the election would serve the remainder of a senator's unexpired term. Kennedy suffered a seizure in May 2008 at his home on Cape Cod. Shortly after, doctors diagnosed a brain tumor -- a malignant glioma in his left parietal lobe. Surgeons at Duke University Medical Center in Durham, North Carolina, removed as much of the tumor as possible the following month. Doctors considered the procedure a success, and Kennedy underwent follow-up radiation treatments and chemotherapy. A few weeks later, he participated in a key vote in the Senate. He also insisted on making a brief but dramatic appearance at the 2008 Democratic convention, a poignant moment that brought the crowd to its feet and tears to many eyes. Kennedy died one year to the day after that appearance. "I have come here tonight to stand with you to change America, to restore its future, to rise to our best ideals and to elect Barack Obama president of the United States," Kennedy told fellow Democrats in a strong voice. Kennedy's early support for Obama was considered a boon for the candidate, then a first-term senator from Illinois locked in a tough primary battle against former first lady Hillary Clinton. Kennedy predicted Obama's victory and pledged to be in Washington in January when Obama assumed office -- and he was, though he was hospitalized briefly after suffering a seizure during a post-inaugural luncheon. He launched his political career in 1962, when he was elected to finish the unexpired Senate term of his brother, who had become president in 1961. He won his first full term in 1964. He seemed to have a bright political future, and many Democratic eyes turned to him after the killings of his brothers. But a July 18, 1969, car wreck on Chappaquiddick Island virtually ended his ambitions. After a party for women who had worked on his brother Robert's presidential campaign, Kennedy drove his car off a bridge on Chappaquiddick, off Cape Cod and across a narrow channel from Martha's Vineyard. While Kennedy managed to escape, his passenger, Mary Jo Kopechne, drowned. In a coroner's inquest, he denied having been drunk, and said he made "seven or eight" attempts to save Kopechne before exhaustion forced him to shore. Although he sought help from friends at the party, Kennedy did not report the accident to police until the following morning. Kennedy eventually pleaded guilty to leaving the scene of an accident. In a televised address to residents of his home state, Kennedy called his conduct in the hours following the accident "inexplicable" and called his failure to report the wreck immediately "indefensible." Despite the dent in his reputation and career, Kennedy remained in American politics and went on to win seven more terms in the Senate. Kennedy championed social causes and was the author of "In Critical Condition: The Crisis in America's Health Care." He served as chairman of the Judiciary and Health, Education, Labor, and Pensions committees and was the ranking Democrat on the Judiciary and Armed Services committees during periods when Republicans controlled the chamber. Obama named Kennedy as one of 16 recipients of the 2009 Presidential Medal of Freedom, America's highest civilian honor. A White House statement explained that the 2009 honorees "were chosen for their work as agents of change." Born in Boston on February 22, 1932, Edward Moore Kennedy was the last of nine children of Joseph P. Kennedy, a prominent businessman and Democrat, and Rose Fitzgerald Kennedy. Joseph Kennedy served as ambassador to Britain before World War II and pushed his sons to strive for the presidency, a burden "Teddy" bore for much of his life as the only surviving Kennedy son. His oldest brother, Joe Jr., died in a plane crash during World War II when Kennedy was 12. John was assassinated in Dallas, Texas, in 1963, and Robert was killed the night of the California primary in 1968. Ted Kennedy delivered Robert's eulogy, urging mourners to remember him as "a good and decent man who saw wrong and tried to right it; who saw suffering and tried to heal it; who saw war and tried to stop it." The family was plagued with other tragedies as well. One sister, Kathleen, was killed in a plane crash in 1948. Another sister, Rosemary, was born mildly retarded, but was institutionalized after a botched lobotomy in 1941. She died in 2005 after more than 60 years in mental hospitals. Joseph Kennedy was incapacitated by a stroke in 1961 and died in November 1969, leaving the youngest son as head of the family. He was 37. "I can't let go," Kennedy once told an aide. "If I let go, Ethel [Robert's widow] will let go, and my mother will let go, and all my sisters." Kennedy himself survived a 1964 plane crash that killed an aide, suffering a broken back in the accident. But he recovered to lead the seemingly ill-starred clan through a series of other tragedies: Robert Kennedy's son David died of a drug overdose in a Florida hotel in 1984; another of Robert's sons, Michael, was killed in a skiing accident in Colorado in 1997; and John's son John Jr., his wife Carolyn and sister-in-law Lauren Bessette died in a 1999 plane crash off Martha's Vineyard. In addition, his son Edward Jr. lost a leg to cancer in the 1970s, and daughter Kara survived a bout with the disease in the early 2000s. Kennedy was forced to testify about a bar-hopping weekend that led to sexual battery charges against his nephew, William Kennedy Smith. Smith was acquitted in 1991 of charges that he raped a woman he met while at a Florida nightclub with the senator and his son Patrick, now a Rhode Island congressman. Like brothers John and Robert, Edward Kennedy attended Harvard. He studied in the Netherlands before earning a law degree from the University of Virginia Law School, and worked in the district attorney's office in Boston before entering politics. Kennedy is survived by his second wife, Victoria Ann Reggie Kennedy, whom he married in 1992; his first wife, Joan Bennett; and five children -- Patrick, Kara and Edward Jr. from his first marriage, and Curran and Caroline Raclin from his second.